James Terry Sanford was born on August 20, 1917 in Laurinburg, NC, the son of Cecil Leroy Sanford and Elizabeth Terry (Martin) Sanford. He attended the University of North Carolina at Chapel Hill and graduated in 1939. He served as a Special Agent for the Federal Bureau of Investigation (FBI) for two years. On July 4, 1942, James Terry Sanford married Margaret Rose Knight, daughter of John Richard Knight and Elizabeth (Ford) Knight of Hopkinsville, KY; they had two children. During World War II, James Terry Sanford enlisted as a Private in the U.S. Army and later attained the rank of 1st Lieutenant. He parachuted into France with the 517th Parachute Infantry Regiment and subsequently fought in the Battle of the Bulge. He also served in Italy, Belgium, and Germany during the war. He was awarded the Bronze Star and Purple Heart for his bravery and wounds, respectively, and he was honorably discharged in 1946. From 1946 until 1948, James Terry Sanford was Assistant Director of the Institute of Government of the University of North Carolina at Chapel Hill, NC. He then launched his private law practice in Fayetteville, NC. In the 1960 general election, James Terry Sanford was elected as the next Governor of North Carolina. He served one term from January 5, 1961 to January 8, 1965. Gov. Sanford nearly doubled North Carolina's expenditures on public schools. He began consolidating the University of North Carolina system to ensure its solvency and strength and oversaw the creation of the North Carolina Community College System. He conceived the idea for the Governor's School of North Carolina, a publicly funded six-week residential summer program for gifted high school students in the state. Gov. Sanford established the North Carolina School of the Arts (now University of North Carolina School of the Arts) to keep talented students "in the fields of music, drama, the dance and allied performing arts, at both the high school and college levels of instruction" in their home state. Gov. Sanford fought for racial desegregation, and even sent his son to a desegregated public school at a time when such a position was politically unpopular and possibly dangerous. He also established the North Carolina Fund under the leadership of George Esser to fight poverty and promote racial equality across the state. Controversial tax increases were made to finance these educational programs. One such tax, on food, roused much opposition and was decried as regressive by many, including by some of the governor's most loyal supporters. The food tax, nicknamed "Terry's Tax," and other taxes implemented by Gov. Sanford diminished his popularity and were heavily criticized by his political opponents. After his term in office ended, James Terry Sanford opened another law firm. He had agreed to serve as President Lyndon B. Johnson's campaign manager in 1968 just before Johnson's withdrawal on March 31st, and later took over as the campaign manager for the Democratic nominee Hubert Humphrey in his race against Richard Nixon for the presidency. President Johnson wanted Humphrey to pick Sanford as his running mate. On one occasion, the Humphrey campaign asked Sanford if he wanted to be the vice presidential candidate, but he declined . In 1969, James Terry Sanford became President of Duke University, a position he held for the next sixteen years. While involved in nearly every aspect of the university, Sanford primarily focused on fund-raising, athletics, and relations with university trustees. After retiring as President of Duke University in 1985, James Terry Sanford remained active in party politics. He made an unsuccessful run for chairman of the Democratic National Committee in 1985. In November of 1986, James Terry Sanford was elected to represent North Carolina in the U.S. Senate, and he served until 1993, when he lost his re-election bid. James Terry Sanford wrote several books, including: "But What About the People?," where he describes his efforts during the 1960s to establish a system of quality public education in North Carolina; "Storm Over the States," where he lays forth a new groundwork for state government and the federal system by recommending a creative federalism; and "Outlive Your Enemies: Grow Old Gracefully," where he describes actions that will slow the aging process and rules for prolonging healthy life. He also taught classes in law and political science at Duke University and campaigned for the construction of a major performing arts center in the Research Triangle area that would provide a permanent home for the American Dance Festival, the North Carolina Symphony, and the Carolina Ballet. James Terry Sanford practiced law again in his later years and merged his own firm with that of another former governor, James Holshouser. Holshouser continued to practice with Sanford Holshouser LLP until his death (the firm continues under that name), and their economic development consulting firm continued under that name. In late December of 1997, James Terry Sanford announced that he had been diagnosed with inoperable esophageal cancer and that his doctors said he had a few months to live. After his release from the hospital, his condition slowly deteriorated. He died in his sleep while surrounded by his family at his Durham home on April 18, 1998, and he was buried in the Duke University Chapel in Durham, NC. 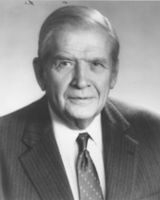 James Terry Sanford (August 20, 1917  April 18, 1998) was a Democratic politician from the Southern United States. A native of North Carolina, he was a North Carolina state senator from 1953 to 1961, governor of North Carolina from 1961 to 1965, and United States Senator from 1986 to 1993. Sanford was noted for his progressive leadership in the fields of civil rights and education. Sanford was born in Laurinburg, NC to Cecil and Elizabeth Sanford. Sanford became an Eagle Scout in Laurinburg's Troop 20 of the Boy Scouts of America (BSA). The BSA recognized him with their Distinguished Eagle Scout Award as an adult. He graduated from the University of North Carolina at Chapel Hill. Sanford served as a special agent in the FBI for two years. During World War II, he enlisted as a private in the US Army as a paratrooper, parachuted into France in combat with the 517th Parachute Infantry Regiment, was awarded the Bronze Star, attained the rank of first lieutenant, and was discharged in 1946. He married Margaret Rose Knight on 4 July 1942, and had two children with her, a son, Terry Jr. and a daughter, Elizabeth. Sanford was elected to the governorship of North Carolina in 1960 and served to 1965. Driven by his belief that a person could accomplish anything with a good education, Sanford nearly doubled North Carolina's expenditures on public schools during his term. He consolidated the University of North Carolina school system to ensure its solvency and strength. He conceived the idea for the state's Governor's Schools for talented children. He established the North Carolina School of the Arts to keep creative children in their home state. And he fought for racial desegregation - even sent his son to a desegregated public school at a time when such a position was politically unpopular and possibly dangerous. He also established the North Carolina Fund under the leadership of George Esser; it was meant to fight poverty and promote racial equality across the state. Tax increases to finance these educational programs diminished Sanford's popularity and were energetically exploited by his political opponents. Governor Sanford was a close political ally of President John F. Kennedy, a fact which disturbed some North Carolina Democrats who were unhappy with Attorney General Robert Kennedy's efforts to push for civil rights. In a phone conversation with Sanford, RFK suggested that for the Governor's own political well-being, perhaps he should publicly distance himself from the Attorney General. Kennedy then joked, "Maybe you should just deny that you've ever met me." Nevertheless, Sanford remained a staunch supporter of the Kennedy Administration. In a 1968 book, President Kennedy's secretary Evelyn Lincoln wrote that Kennedy had stated he intended to replace Vice President Lyndon B. Johnson with Terry Sanford on the Democratic ticket for the re-election campaign in 1964. Additionally, Sanford used his leverage at the White House to blaze the trail for Research Triangle Park (RTP) which sparked an economic surge in the state, eventually luring IBM to the Triangle area. During his tenure as president of Duke University (1969-1985), he mounted two unsuccessful campaigns for the Democratic nomination for the presidency of the United States in 1972 and 1976. He received 77½ votes for president at the 1972 Democratic National Convention, finishing fourth behind George McGovern (1,864.95), George Wallace (381.7) and Shirley Chisholm. Sanford won the Democratic nomination to succeed Senator John P. East in 1986. East committed suicide in July of that year, and Sanford's Republican opponent, Congressman Jim Broyhill, was appointed to hold the seat through November. Sanford defeated Broyhill by three percentage points in the November election. He took office a day later, as a special election to serve the last two months of East's term had taken place the same day. Compared to most Southern Democrats, Sanford was fairly liberal. He chaired the Senate Select Ethics Committee in 1992. Following a serious heart ailment he lost his bid for reelection in 1992 against Lauch Faircloth, a former Democrat who turned Republican with substantial backing from the political organization of Sanford's Senate colleague, Jesse Helms. During the time of his Senate service, he was also involved with the International Commission for Central American Recovery and Development, based at Duke. Sanford spent the twilight of his life as vital as the young. He wrote books, taught and campaigned for the construction of a major performing arts center in the Triangle area that would provide a permanent home for the American Dance Festival, the North Carolina Symphony and the Carolina Ballet. Sanford announced in late December 1997, that he had been diagnosed with inoperable esophageal cancer, and that his doctors had told him he had just a few months remaining. After his release from the hospital, Sanford's condition slowly deteriorated. Sanford died peacefully in his sleep while surrounded by his family at his Durham home. He was 80 years old. Sanford is entombed in Duke University's Chapel. Sanford, James Terry, a Senator from North Carolina; born in Laurinburg, N.C., August 20, 1917; attended Presbyterian Junior College; graduated, University of North Carolina, Chapel Hill, 1939; graduated, University of North Carolina Law School 1946; special agent, Federal Bureau of Investigation 1941-1942; parachute infantry, United States Army 1942-1945; North Carolina National Guard 1948-1960; assistant director, Institute of Government, University of North Carolina 1946-1948; lawyer in private practice 1948-1960, 1965-1969, 1985-1986; North Carolina State senator 1953-1955; Governor of North Carolina 1961-1965; president of Duke University 1969-1985; elected as a Democrat to the United States Senate on November 4, 1986, for the unexpired term of John East ending January 3, 1987, and for the six-year term ending January 3, 1993, and served from November 5, 1986, to January 3, 1993; unsuccessful candidate for reelection in 1992; chairman, Select Committee on Ethics (1992); resumed the practice of law in North Carolina and Washington, D.C.; died in Durham, N.C. on April 18, 1998; interment in Duke University Chapel. James Terry Sanford, governor of North Carolina, was born in Laurinburg, NC on August 20, 1917. His education was attained at Laurinburg High School, at Presbyterian Junior College, and at the University of North Carolina, where he graduated in 1941. After college, Sanford worked for the Federal Bureau of Investigation, but left his position to join World War II. He served overseas as a 2nd Lieutenant and earned a bronze star and purple heart for his service. After the war, he returned to the University of North Carolina and studied law. Sanford first entered politics in 1949, serving as President of the Young Democratic Club. He also served as a member of the NC State Senate from 1953 to 1955; and was the campaign manager for William Kerr Scotts senatorial bid in 1954. Sanford next secured the Democratic gubernatorial nomination, and was elected governor by a popular vote in the 1960 general election. During his tenure, an anti-poverty program was created; the elimination of discrimination practices was promoted; and numerous improvements were made to the states educational system. After completing his term, he returned to his legal practice. In 1969 he secured an appointment to serve as President of Duke University, a post he held until 1985. In his last political position, Sanford served in the U.S. Senate, an office he held from 1986 to 1993. James Terry Sanford passed away on April 18, 1998, and was buried in the Duke University Chapel in Durham, NC.